Carbide shank holder with 45 degree engraving carbide inserts. • Economical! Each indexable insert has 2 cutting edges. No resharpening required. Tool length is unchanged. • Suitable for engraving all types of materials, such as plastic, non-ferrous metal, aluminum, copper, carbon steel and stainless steel. It performs excellently without producing any burrs, especially in copper, aluminum and stainless steel. • High Speed, High Feed Rate. Designed to run at high speed, up to 40,000 r.p.m. Reduces engraving cycle time! • No need to reset after changing insert or cutting edge. Carbide shank holders designed for shrink-fi t holder, engraving machines, high speed cutting. NC2032 : K20F grade, for steel from 30~50 HRC, carbon steel, alloy steel & cast iron. NC2071 : K20F grade, for steel < 30 HRC, non-ferrous metal & stainless steel. 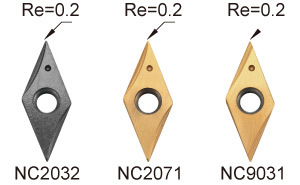 NC9031 : K20F grade, for non-ferrous, ex : aluminum, brass, copper, titanium, plastic & acrylic. Sharp edge for shallow engraving.